Male Barn Swallows have blue black upper parts with a reddish brown forehead and breast. Females are typically less vibrantly colored. Barn swallows are the only swallow species with white-spotted forked tails. These slender, sleek birds are well known for their long migration and nesting habits. They are very territorial and will always come back to the same nesting site. Barn swallows have made a very successful switch from cliffs and caves to man-made structures for placement of their mud pellet nests. Increased insect populations from modern agriculture and shelter created by man-made structures are two reasons given for this transition. 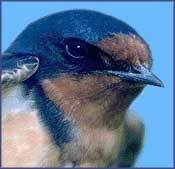 The barn swallow call is a repetitive clipped chi-dit, chi-dit or wit-wit. Hear It Now! Swallows can be a nuisance in suburban areas due to their nesting habits. The mud nests damage and deface the outer walls and eaves of residences and office buildings. Building sides often end up smeared with feces from the bird colony along with collecting on the ground. Homeowners have also reported problems with parasites entering the house through building cracks next to the nests which poses a potential health risk to humans and animals. Swallows are a protected species under the Federal Law. You cannot disturb them once they lay their eggs in the nest. The most effective way to eliminate barn swallow problems is to take down the nests in the winter after they are gone and exclude them from returning by using products like BirdNet or Bird Spikes which eliminates their roosting spots. Other possible means to repel away large flocks of swallows is with combinations of audio-visual scare devices such as the ultrasonic bird repellers, QuadBlaster 4 or Ultrason X unit combined with a visual scare device like Terror Eyes holographic balloon. See our complete list below of recommended bird deterrent products to repel barn swallows. A "synergy" or combination of bird repellent products typically offer the most successful solution for repelling barn swallows. For bird control solutions, we often recommend using companion products by combining electronic sonic repeller devices or bird hazers with visual scare deterrents, physical bird barriers or scent and taste aversion products. This kind of multi-sensory attack is extremely effective in deterring pest barn swallows for good! BirdXPeller ProSonic bird repeller emits real bird distress calls and predator sounds to scare away birds for up to 1 acre. QuadBlaster QB-4Ultrasonic bird repeller blast birds and bats out of semi-enclosed, indoor areas with silent ultrasonic waves. Ultrason XOutdoor, ultrasonic bird control device uses "silent" high-pitch frequencies that only birds and bats can hear. Bird BlazerElectronic laser bird control device covers large indoor spaces while distracting and confusing pest birds, rodents and bats. Flock Off! UV PaintUV reflective paint creates a visually intense barrier that birds instinctively avoid. Terror EyesVisual scare predator, menacing 3D balloon with holographic eyes repels pest birds and small animals. Bird Netting - Standard MeshStandard Mesh, 3/4" bird netting is perfect to protect areas around the home or garden from birds. Plastic Bird SpikesPlastic bird spikes create a physical barrier to prevent birds from landing on rooftops and ledges. Shock TapeAdhesive-backed conductive tape sends a low voltage zap to stop birds from perching on surfaces.